Stop Standard Bank funding air pollution and making us sick! End Chevron’s impunity! 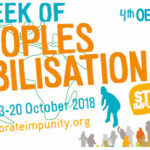 An International Treaty on Human Rights and Transnational Corporations is Urgently needed!